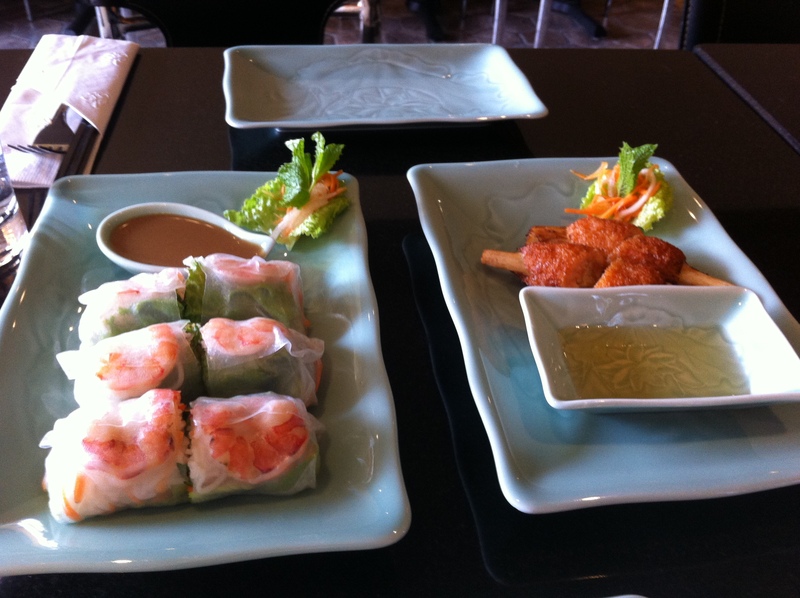 Vietnamese food is one of my favourites. I love the freshness of the cooking, the bright pickled vegetables, fresh herbs, salty fish sauce, and sweet tenderness of the meat. Ha Long Bay claims to be “vietnamese fine dining”. I went in wondering how it would compare to Pho Hung, one of my favourite restaurants in the city and certainly NOT fine dining. I came out thinking Ha Long Bay soundly defeated Pho Hung in terms of decor and service, but didn’t impress me in the most important category: food. We ordered an array of appetizers and a vermicelli bowl to get our feet wet. Most of themenu sounded completely delicious– with delightful fresh flavour combinations. We tried the Spring Rolls, Summer Rolls (there are also Fall and Winter Rolls on offer), the Evergreen Shrimp, the Cubed Beef Skewers, and a person favourite of mine, the Sugarcane in a Blanket (Chao Tom). The Spring Rolls were 3 small rolls with fish sauce- nothing special. The 3 summer rolls were your typical fresh roll- a good balance of flavours accompanied by a peanut sauce that was a bit too creamy for me. The Evergreen Shrimp tasted a bit off and was basically overcooked shrimp rolled in rice krispies. The beef skewers had nice flavour, but the meat was a bit tough and they were pretty wimpy looking, and the sugarcane in a blanket was overcooked. The vermicelli plate was also a bit disappointing– the noodles were sort of wet and warm, although the sauté beef was quite tender. The good news was that the bill was manageable since we didn’t order any of the bigger ticket entrees, which can cost up to $20. 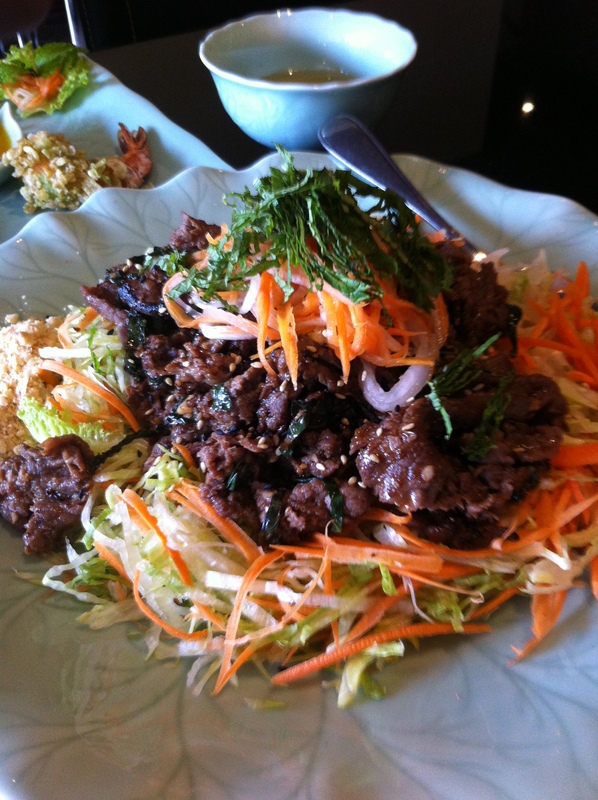 Ha Long Bay isn’t a bad option if you want vietnamese food in a classier setting, or if you live in the area. Maybe some of their soups, salads, curries or entrees would be worth a try– but I think I’m sticking to Pho Hung. This entry was posted in Viet/Thai and tagged curry, fresh rolls, soup, spring rolls, vermicelli bowls. Bookmark the permalink.